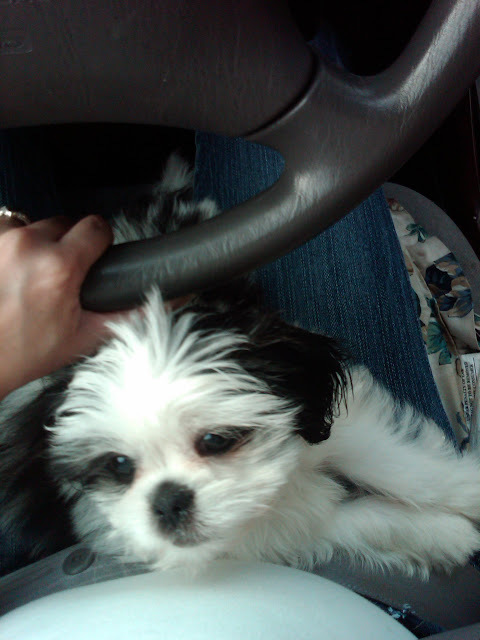 When Gracie was younger (she is almost 11 weeks now), riding in the car was no problem. She would spend a lot of time sleeping in her pink dog bed (see picture below). Her bed is actually her “comfort” place. She crawls in it whenever she needs comfort and mama is too busy to play with her. I also place all of her toys in her bed whenever she’s not playing with them. (It’s like cleaning after a little child sometimes!) So in the car ride, she typically sleeps or sits in her bed the entire car ride. Recently this has changed. Last time I took her home, she slept for the first hour and the second hour, she whined and whined until I picked her up. She’s still small enough that I can hold her in one arm while driving. Once she settled down and no longer whined, I placed her on my lap where she fell asleep… When I placed her in her bed again, she slept for a few minutes and then started whining again. I am not sure why this change and why she doesn’t like being in the car. She used to love it… But I do need her to outgrow this strange habit, because when she gets older, it will be too dangerous for her to sleep in my lap while I’m driving. 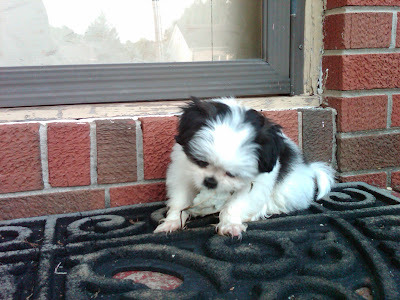 My little shih tzu puppy, Gracie, has a very bad habit of chewing on leaves, grass blades, and sticks when she’s outside. Instead of going to potty right away once I take her outside, Gracie has to run around, sniff around in the grass, and chew and eat anything that comes in her way. My little Gracie is growing up so fast. There are three steps leading up to my home. Only a week and a half ago, Gracie could only jump up the first two (when she wanted to) and she would whine because she couldn’t get to the third. Now, she hurdles past all three pretty quickly. If she wants to jump, she does without any whining or problems! Look at how tall she is now. Only two weeks ago, when I first got her, her head barely fit over the step. I think Gracie is growing too fast… Literally. 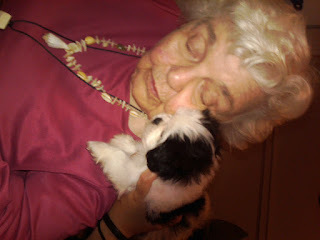 I wanted her to be a smaller sized shih tzu, which is what the breeder had told me she would be. Only about 5 lbs . . . Oh no, Gracie is going to be on the larger size. She will be 8 weeks this Saturday, and I think my baby is already over 2 pounds. She will possibly be 3 pounds on Saturday. 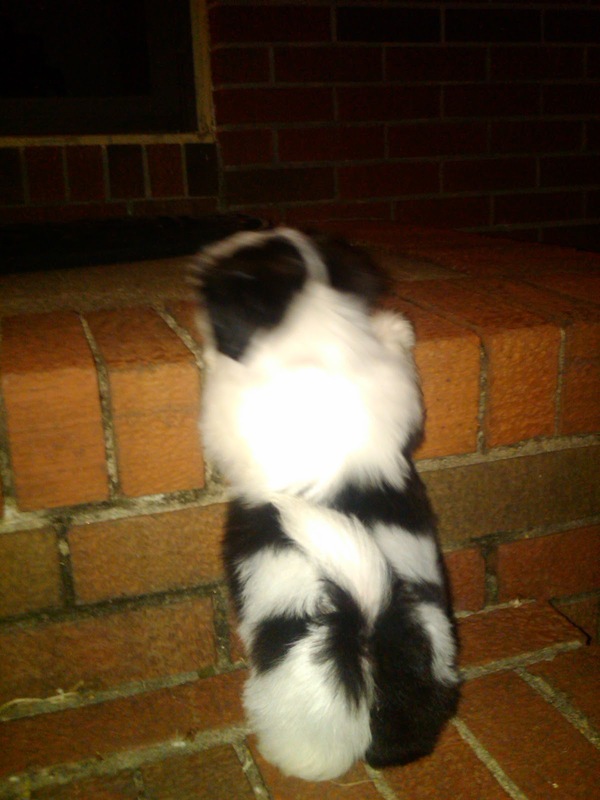 I guess she will be average shih tzu size when she’s all grown up — around 10 pounds or so. Sadness. But I still love her, and I wouldn’t give her up for anything in the world. I always toyed with the idea of those “teacup” dogs, because I want a purse dog, but I read that they have many health issues, their bones are easily broken, etc. With how hyper and active Gracie is, I’m sure that if she was a teacup, she would have many broken bones by now. 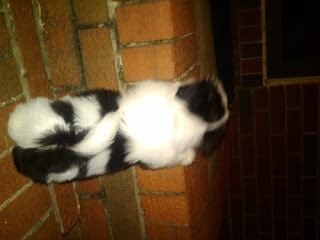 That puppy is always falling over when she runs… Chasing after the cat and the black lab. She’s simply cute! And I love her, regardless of how big she gets. This weekend was my American grandmother’s 96th birthday. I made a cake and I brought Gracie over to visit my grandma, and she had a blast. 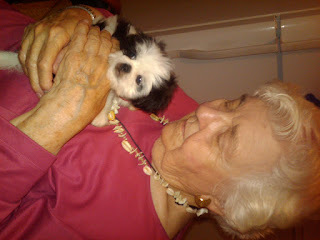 My grandma loved her too! But then again, who can resist such an adorable sweet face? My little Gracie is growing up so, so fast. I feel like she’s getting bigger every second! She still looks like a guinea pig from far away — the size of one anyway. I love her little one! After owning two cats — which everyone knows are very independent creatures — it is nice to come home to a very lively and needy puppy. Even on the worst days, or the worst weeks (as this one has been), Gracie is always so happy to see me. Giving her mama lots of puppy kisses and affection. She does have a bad habit of biting my ear, since she is teething, but it’s still so adorable. Of course, I give her lots of human kisses in return. I’m not sure if she knows what they are, but she enjoys them. Or at least they make her even more into licking me. It’s quite sweet! I also get lots of puppy kisses in the very early morning hours. When she wakes up at 4 or 5 am, I feel her kissing and licking all over my face. I am not sure if this means “Hey mama! I have to go potty” or if this is just her being sweet. At least she doesn’t go potty in the bed. She waits until I take her off the bed (and if I’m not watching, she may accident pee on the floor). Sometimes, I leave her on the tall bed until after I dress. Then, I take her outside to go potty. This morning I was too tired, so I just placed a potty pad on the ground and she peed on the very edge of it. So I had to soak up the rest of the pee with the rest of the potty paid. When I get paid next week, I will have to purchase those pee-remover sprays so she doesn’t recognize the scent and go to the bathroom at that same spot. At least, she potties outside. She runs to the door to go outside now. So that’s a plus when it comes to the potty training. Now, I have to buy her a little bell and place on the door, and train her how to use the bell. Ahh, the joys of pet parenthood. 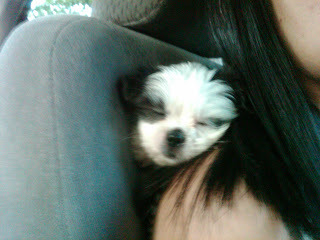 I love my little shih tzu puppy! I seriously think that Gracie is the most perfect puppy a first time dog owner can have! She’s only six weeks old, but she’s been controlling her little bladder perfectly. I have been technically crate training her (though she only stays in her crate when I’m at work during the day), and she has not had a few “accidents” in my home. One “accident” was because I had allowed her to walk to the front door from her room, instead of picking her up immediately after feeding her (which is my habit). Once she got a few feet from the door, she couldn’t hold it anymore and she pooped on the carpet. I immediately swooped her up, said “NO” loudly, and took her outside. Unfortunately the deed was done, so I don’t think she realized what was going on. She is still young, after all. But I won’t make that mistake again. From that day onward, I have picked her up several minutes after she finished eating and drinking and took her outside. So you might be wondering, why no puppy pads? I have asked friends who are pet owners about training my dog with pee-wee pads, and they have said that if I started training Gracie with the pads, she would always go to the bathroom in the house. I don’t want her to get into that habit, so I’m training her to go outside. Plus, the first night that I got her, I did try a pee-wee pad. (I had thought it would be more convenient for when it rains and there’s bad weather outside). She did go on the puppy pad, since her breeder had trained the litter to use newspaper outside their crate… but I noticed the next morning that Mr. Pumpkin, my cat, had also used the pad… and had missed, peeing on the carpet. As you may know, cat pee is the worst smell in the world and very difficult to get rid of. So I’m guessing there is some pet rivalry going on there. For the time being, I am training Gracie to go outside only. So far, it’s worked. She has a favorite spot to go poop. It’s behind one of the bushes outside. After she eats, and first thing in the morning after I feed her, I take Gracie outside to do her business. So far, she does it every time. Of course, it does take her a little while. She loves eating grass, sniffling around, and chasing after me. But after about five minutes, she ends up going. I always give her lots of love and kisses afterwards. She sleeps with me in the bed every night, and so far, she has not peed or pooped in the bed. At all. I just felt that it would help her bond with me better if she was able to sleep with me. Plus, no whining at night! She sleeps through the night, and is simply the sweetest cuddliest thing ever! But in the next few weeks, as she grows, I wonder what potty training will bring. It’s been very easy so far! She’s still very small, and I am going to be a tad bit heartbroken once she grows. I love her being so little! Finding the perfect name for my puppy has been very difficult. Every since I’ve had her (less than a week), I just haven’t been able to give her a good name. I’ve tried everything — looking at baby name books, browsing the web for dogs names, asking friends for advice, etc. — but I just haven’t been able to come up with anything. When she first arrived home, I started calling her Sydney. (The name I’ve always wanted to give my daughter). But after sending out picture messages to my friends, no one thought she looked like a Sydney. So I went back to the drawing board. Then, Jarold and I started discussing names… The ones I liked, he didn’t. He wanted to name her Samantha, Sam for short. But since we’d be calling her Sam most of the time… I didn’t want to name my puppy a boy’s name. We thought about going back to calling her Taylor, but she just doesn’t look like a Taylor. 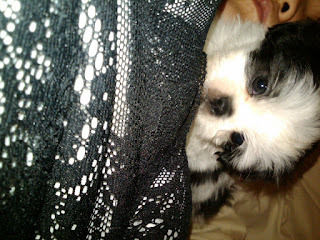 She does look very much like a Panda bear… And I thought of calling her “Panda,” but again, that is a boy’s name. She’s black and white, so a few of my friends on facebook suggested “Oreo.” Or even “Pandora”(combination of Panda in a female name). But again, this just didn’t fit. I saw her adorable face, and I simply felt that I had to name her a sweet, delicate name. She is so adorable that she needed a very girlie name. I finally settled on Sophie. We tried that for a day, but Jarold suggested we kept looking. Then last night, I decided that she would become Gracie Lu. (My black cat’s name is Luka Lu). So that’s her current name… I think it might stick this time. Doesn’t she look like a Gracie to you? The search for the perfect puppy . 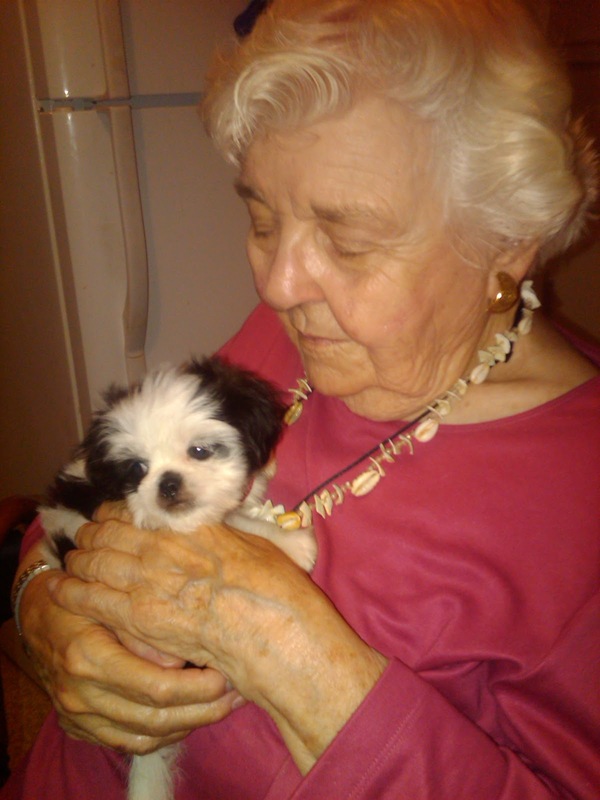 . .
It’s been quite a journey, trying to find the perfect shih tzu puppy. At first, I searched at local shelters, human societies, and pet adoption centers — as these are the cheapest ways to get a puppy — but alas, they did not have any puppies that I was in love with. Many of the dogs available for adoption were too large, or the breeds available did not fit my lifestyle. I needed a smaller dog. For a brief week, I seriously considered finding a Yorkie or Maltese. Both of these dog breeds are small and would be perfect for apartment living. But I still kept going back to wanting a shih-tzu puppy. I knew in the back of my head, and in my heart, that I would not be satisfied with any other breed of dog. Since this would be a lifelong commitment — for the next 15 years or so — I wanted the dog I picked to be perfect. 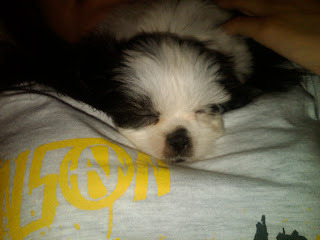 I didn’t want to wait another ten or fifteen years to get the shih tzu puppy I wanted! After several weeks of searching local shelters and rescue places, I just couldn’t find the age that I wanted. I decided to go online and look at breeders. I contacted several places that I found online and in the local newspapers. I checked out prices — some were as high as 600 or 700 dollars, and others on the low end of 100. Some places had health guarantees; others didn’t. Due to the instability of my current job, I was not going to fork over an arm and a leg for a dog. So Jarold and I talked about it, and he persuaded me to get a dog for $300 or less. Isn’t he cute? I had already picked out a name for him — Taylor Hanson Lee. He only cost $300 with a one year health guarantee in the event that he died fro a genetic disease. But the problem was that this lady also bred about seven other types of dogs. She was very nice and answered all my questions. I was all set out to buy this puppy from her… Until I just happened to search in the classified and saw this adorable little girl for $300. Girls are typically more expensive than boys. But I just felt that she was too adorable to pass up. So I contacted the couple that was selling her and agreed to meet them. They were not traditional breeders. They owned shih tzu dogs, and only breed shih tzu dogs. I liked the living conditions of the puppies, and the couple that was selling this female dog was very, very nice and kind. They gave me the veterinarian records, their contact information should I have any questions. And they answered all my questions — even the silly ones. The second that I picked her up, she started licking my face. She did whimper a bit, but I think it was because I was a stranger to her. But once she started licking my face, she calmed down. I sat down and she fell asleep on my lap. A dream come true. I paid the couple and bought my little girl home. She slept with me that first night and did not whine or whimper. I am just in love with her! I named her Sophie… But that name may change. I am still undecided. But for now, she is my Sophie pie. Stay tuned to learn all about Sophie’s life with her new mama! She was a sweetheart, but an absolute handful. She was five or six months, and a boxer mix. So she was a pretty large dog — to me, she was anyway. She was absolutely not potty trained, and the rescue shelter did not want me to crate train her. (Big mistake of mine even agreeing to foster her without crate training!) Because I had no experience with dogs or puppies at this point, I thought fostering would be a wonderful opportunity for me to learn how to take care of a dog… Which would have been fine, if I had been able to crate train Honey. You would think that after that experience, it would scare me from wanting a dog. But it didn’t. Despite Honey’s fleas and worms, she was simply the sweetest dog. She greeted you at the door, wanted to be near me at all times. She loved playing catch in the apartment. I simply loved having her company and being near her. Returning her to the rescue shelter was one of the saddest things I’ve ever had to do. She sat in the car so patiently in the back seat, and my heart broke into a million pieces. As much as she did not fit into my lifestyle — she was simply too big — I still fell in love with her. After that experience, I decided that I could no longer foster a dog. It’s simply too hard for me, being the animal lover that I am, to foster dogs. Giving them up is way too difficult. It took me a month to recover from having honey with me every day. I missed her every day, and I will always miss her. 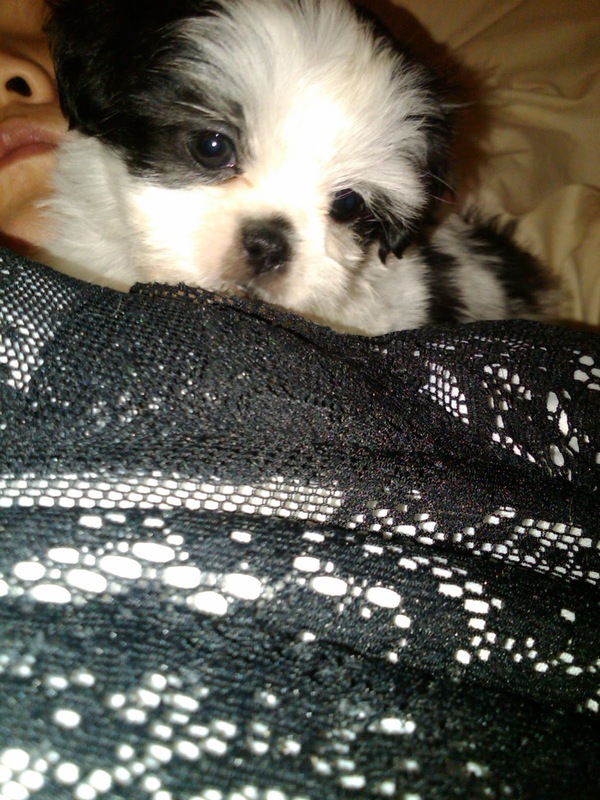 But once I was finally recovered, the search for my perfect shih tzu began again. Eventually, when I became a teenager, I became obsessed with wanting a shih tzu. I think I heard a rumor that Hanson (my favorite band of all time) had owned a shih tzu in the past, but that particular dog accidently ate rat poison and died. Being the Hanson fan that I am, I just simply wanted the same kind of dog that they had. Plus, it turns out shih tzus are simply too adorable! How could I resist? 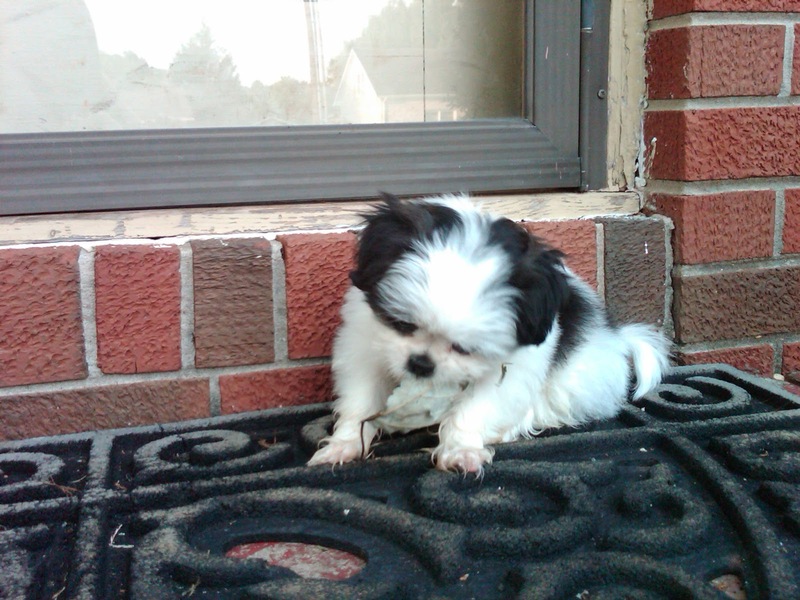 For many, many years, my profile picture was a little brown and white shih tzu puppy. I wanted that breed from that time forward. I was always the one in the family who wanted to go to the rescue shelters to look at the puppies. In fact, in Nashville, there was an adoption center near my home called Love at First Sight. You have no idea how many times I asked my babysitter to take me to Love at First Sight. Of course, I always wanted to adopt a dog whenever I was there, and I always got a “We have to ask your parents first” in response. Dogs were a no-no in my family. My dad loves animals, but my mother was a different story. She is OCD and cleans constantly. A shedding furr-ball, no matter how cute, is simply a big fat NO. So, I lived my life without a dog, or any animals for that fact, for many, many years. When I was in college, I was in a long-term relationship with a man who was allergic to animals. So again, dogs were a big fat NO. However, we did end up adopting a cat together. A little black kitten named Luka Lu Nguyen-Cornelius. Read about how I ended up adopting her HERE. So after so many NOs, it seemed that my life was doomed to be dog-less. Pretty soon, my dream was squashed and I decided to get over this silly notion of dog ownership. The flame-point Siamese cat that currently lives with me — Mr. Pumpkin. 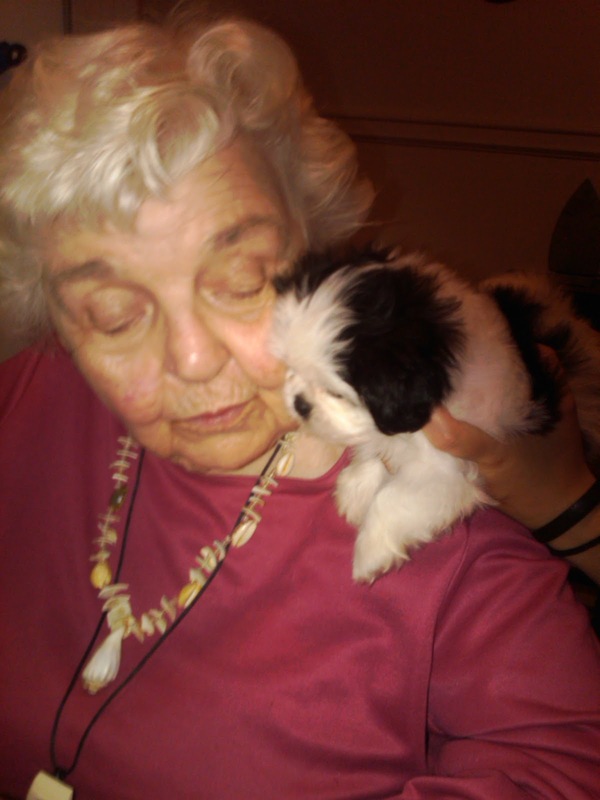 One spring morning, my current boyfriend, Jarold, surprised me by taking me to a roadside stand where a backyard breeder was selling shih tzu puppies. It reignited something inside me, and I simply had to have a puppy. It had been too long. This lifelong dream of mine simply had to come true! 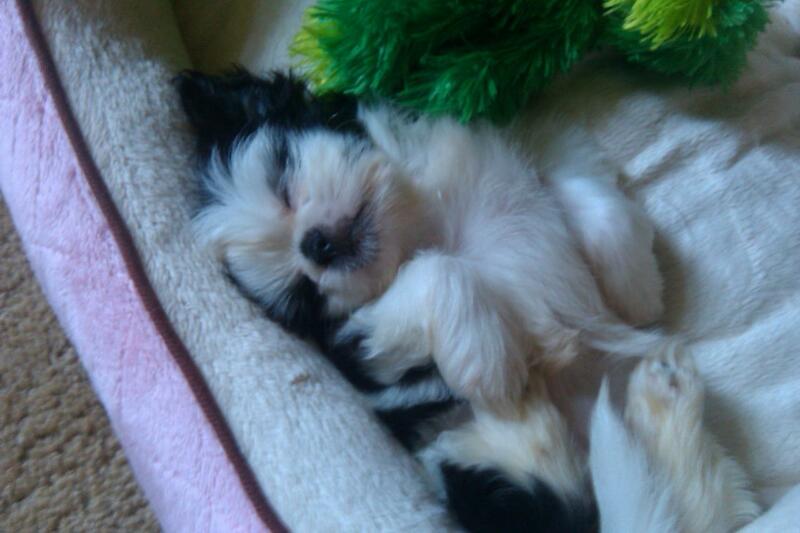 This is the shih-tzu puppy I seriously considered adopting that day. But since it was a backyard breeder on the side of the road, I decided I need to do more research into purchasing a shih tzu. This is my new little girl…. 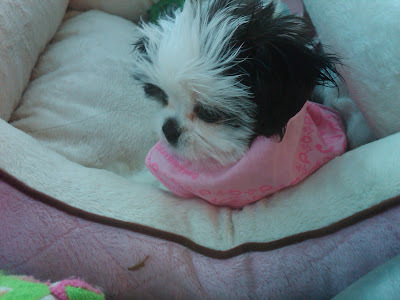 This blog is dedicated to her, and it will chronicle my adventures as a first time dog owner, raising a shih-tzu puppy. Learn more about what I went through to find her, and my puppy experience …. including taking in a foster puppy for a few days.